Kareena Kapoor, who is currently shooting for her next movie Good News in Mumbai, brought along her son Taimur Ali Khan on the sets of the film. Kiara Advani, who is also playing a pivotal role in the film, shared a video with the little munchkin on her Instagram stories. "The real star on set. Keeping up with Tim Tim," Kiara captioned the video. 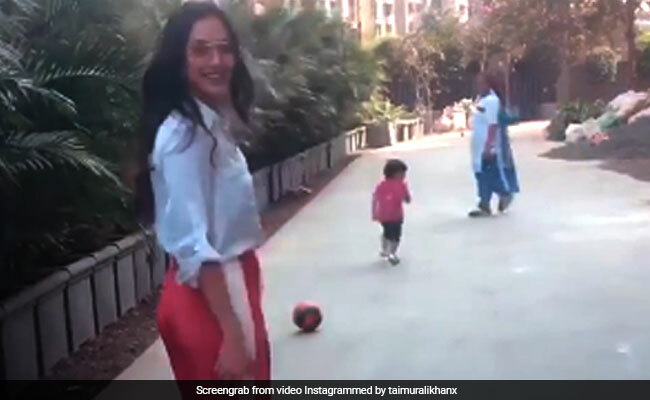 Little Taimur can be seen all smiles playing with Kiara Advani and the actress also appears to be enjoying her time with the munchkin. Good News, which also stars Akshay Kumar and Diljit Dosanjh, revolves around a Punjabi married couple trying to have a baby. Kiara Advani and Diljit Dosanjh are playing the role of a married couple in the people. Not just Kareena Kapoor, Taimur often accompanies his father Saif Ali Khan on shooting locations. Last month, Taimur was photographed at a beach location in Mumbai where Saif was shooting for the second season of Netflix web-series Sacred Games. Directed by Raj Mehta, Karan Johar's Dharma Production is producing Good News. The film went on floors in November last year but Kareena Kapoor and Akshay Kumar started shooting for the film in January 2019. Kareena Kapoor is collaborating with Akshay Kumar after a span of 10 years. Kareena and Akshay have previously worked together in films like Ajnabee, Aitraaz, Tashaan, Dosti and Bewafaa. Kareena had an extended cameo in in Akshay Kumar's 2015 release Gabbar Is Back. Kareena Kapoor's last release was Veere Di Wedding, which also featured Sonam Kapoor, Swara Bhasker and Shikha Talsania. She also has Karan Johar's Takht in the pipeline.